It's here at last. This week I've been counting off the days like a kid on the run-up to Christmas. I'd promissed another post on gear selection but it's been a hellish week at work. Suffice to say, with food and water, I'll have around 10.5kg on my back on the walk in. Add to that 1kg of camera gear slung across my shoulder and you get a weight that I'm more than happy with. Better still it looks like for once we've hit the jackpot and the damn rain pants are staying at home. In their place will be a coolmax shirt. There'll be more about gear on my return. I'll be getting an alpine start in the morning. A taxi will collect me at an unholy hour and whisk me off the Schiphol. I should be swinging my rucksack up onto my back at 4pm. By late evening I'll be looking for a good bivouac at around 1400m. The latest forecasts are good for the front end of the trip. Sun and clear skies for Saturday and Sunday. Night time temperatures of 10 degrees C are predicted. Monday could be wet. We decided on a new strategy at the last minute. We've ditched a tarp so we have just enough silnylon to cover our heads incase things turn unexpectedly bad. 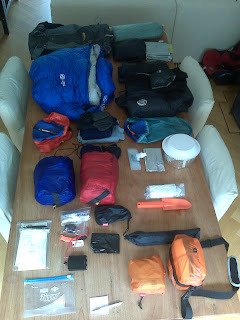 In the process we've lightened one rucksack by around a kilo. We'll also do the route in the opposite direction. We'd been saving the most spectacular ridge for the last full day but wet conditions could kill that plan. Now we'll try to get the traverse from Ljosabelgen to Veslesmeden under our belts in the sunshine on the Saturday. Like wise the Digerronden to Hogronden traverse on the Sunday. If things turn out as forecast on the Monday we'll head for Rondvassbu and either a low level camp or a night in the hut. The lights will be out here for a week or so. Have fun, mind and take loads of photie's! Have a good trip Dave!